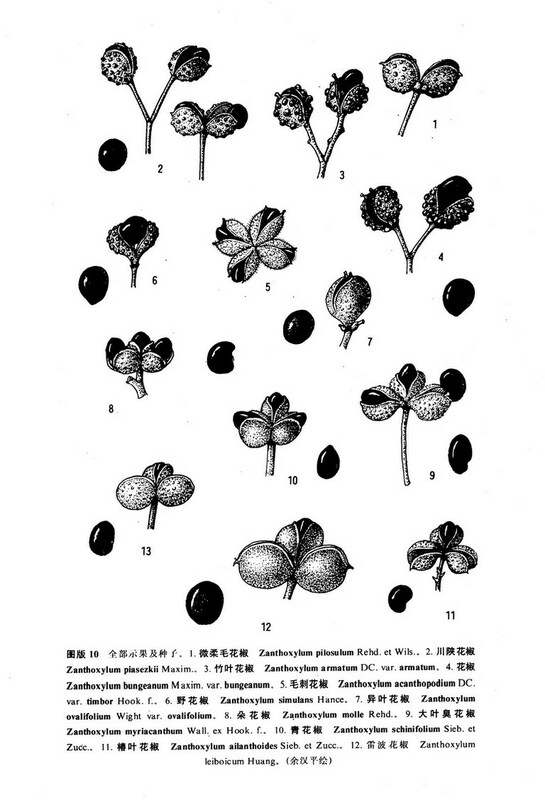 椿叶花椒 Zanthoxylum ailanthoides Sieb. et Zucc. 芸香科 Rutaceae | | 花椒属 Zanthoxylum | | 椿叶花椒 Zanthoxylum ailanthoides Sieb. et Zucc. Zanthoxylum ailanthoides Sieb. et. Zucc. in Abh. Akad. Mochen 4(2): 138. 1846; Miq. in Ann. Mus. Bot. Lugd.-Bat. 3: 22. 1867; Hemsl. in Journ. Linn. Soc. Bot. 23: 105. 1886; Hayata, Ic. Pl. Form. 1: 119. 1911; Chun in Sunyatsenia 1(4): 155. 1934; Huang in Acta Phytotax. Sin. 6:44. 1957; 中国高等植物图鉴 2: 542. 图2814. 1972; 台湾植物志 3: 531. 1977.——Fagara ailanthoides (Sieb. et Zucc.) Engl. Nat. Pflanzenfam. 3(4): 118. 1896 et 19a: 221. 1931; Li, Woody Fl. Taiwan 372. 1963.——Zanthoxylum emarginellum Miq. in Ann. Mus. Bot. Lugd.-Bat. 3: 22. 1867.——F. emarginella (Miq.) Engl. l. c. 3(4): 118. 1896.——Z. hemsleyanum Makino in Bot. Mag. Tokyo 21: 86. 1907.——F. hemsleyana (Makino) Makino, l. c. 161. 簕？花椒 Zanthoxylum avicennae (Lam.) DC.